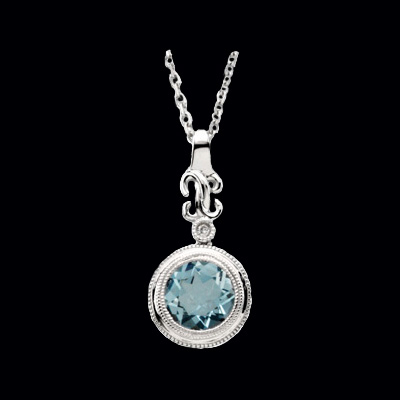 Lovely 14k White gold diamond halo-style birthstone necklace. Center stone is a 7mm round gem and surrounded with a diamond halo. Pretty necklace is available with a large variety of center gems including Amethyst, Aquamarine, Blue Topaz, Citrine, Peridot, Garnet, Pearl, and Opal. Very affordable gift idea. 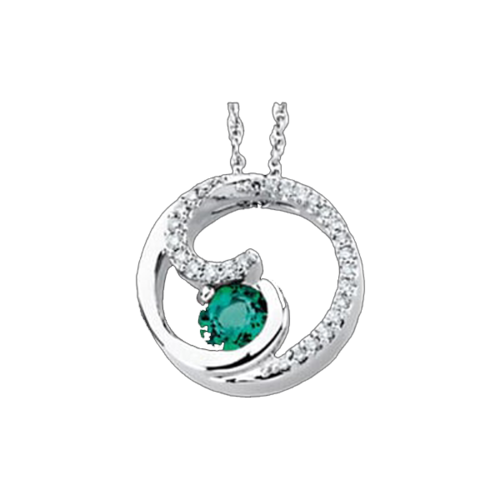 14k White gold circle swirl diamond emerald necklace. This incredible diamond emerald necklace is set with a 6mm round genuine Emerald and 1/4ct tw diamonds. Necklace measures 18" in length. Our Emerald diamond necklace adds just the right touch to your wardrobe. 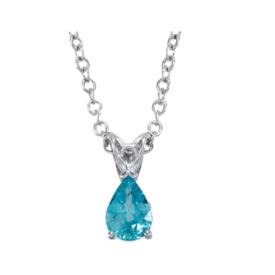 Beautiful 14k white gold and genuine Blue zircon necklace. Blue Zircon is a genuine gemstone not to be confused with cubic zirconia. 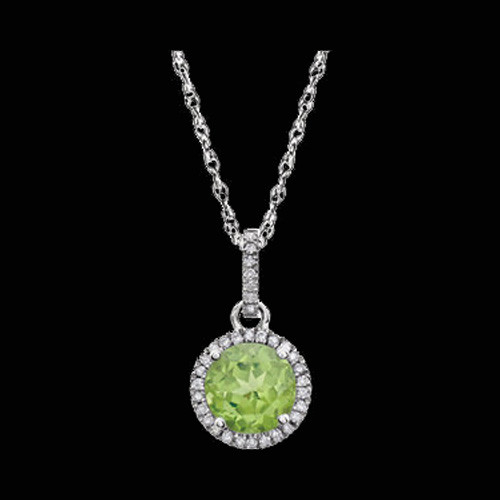 A brilliant 7x5mm pear shaped gemstone sits in a simple basket design pendant on an 18 inch 14k white gold chain. Lovely 14k White gold set pendant holds a 7mm round Aquamarine and a diamond accent. Very nice design. 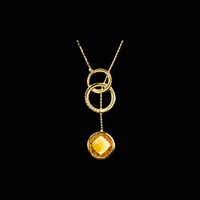 Pendant sits on a 14k gold box chain to create this necklace. Aquamarine is the birthstone for March but also a beautiful watery blue gemstone. Big blue topaz and diamond necklace. 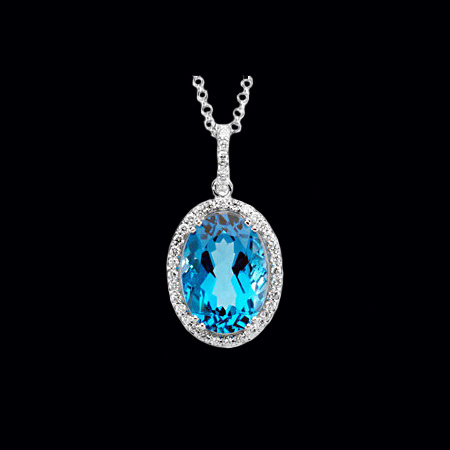 This Swiss blue topaz is a large 14x10mm and is surrounded by 3/8ct tw diamonds. Necklace measures 18 inches in length and is simply delightful. Bring a little luck your way with this 14k yellow gold Tsavorite garnet clover necklace. 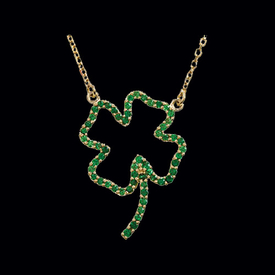 Tsavorite garnet is such a beautiful green, a perfect fit in this gold clover necklace. 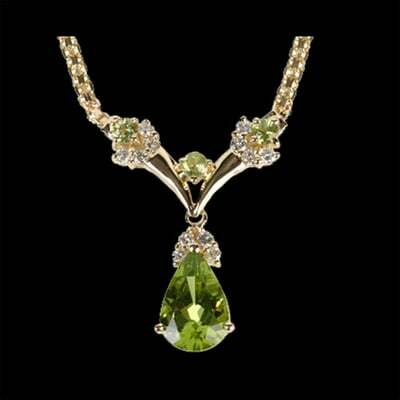 Necklace measures 16 inches in length and the Tsavorite garnets total about 1 ct tw. INCREDIBLE Custom Platinum, Gemstone, and diamond necklace. This necklace is set with a 7x5 Oval genuine Emerald. Emerald is clean and vibrant in color. Diamonds although hard to see in this picture cover the entire necklace. Customize with your favorite gemstones or order as shown. Made to order non returnable item. Hundreds of custom made to order necklaces available. Engravable trendy design 14k gold engravable circle pendant. 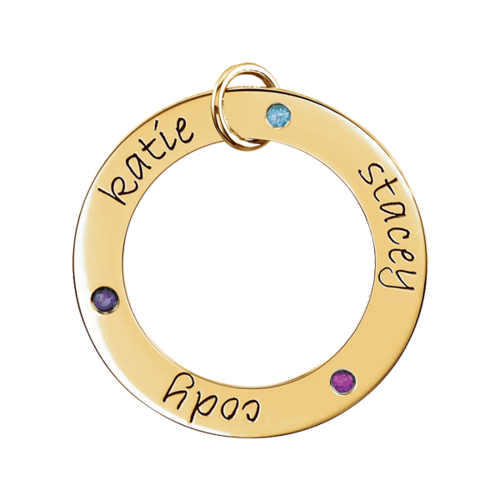 This pendant can be engraved and will hold 2 or more stones if like that option. Pendant is shown with birthdays engraved on the back and names on the front but have it customized to work for you. Available in 14k Yellow or white gold. Fabulous mothers day gift idea.